IBP has a long history of working in Kenya on a wide range of budget issues. Our thematic areas are increasing public understanding of and engagement with budgets, and budget transparency. We engage with civil society, media and government at both national and county level. Our work consists of research, technical assistance and training, and advocacy. See how Kenya has performed in the Open Budget Survey. 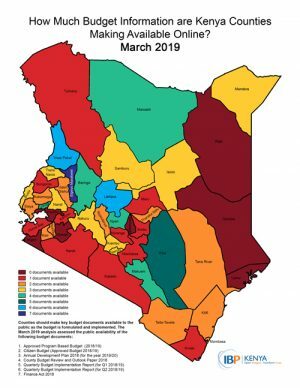 How Much Budget Information are Kenya's Counties Making Available Online? For Kenyan citizens to understand budget decisions being made by county governments and the government’s justifications for different priorities funded, they need access to budget information. Are counties publishing this information in a timely manner? Since January 2015, IBP Kenya has been monitoring the websites of Kenya’s 47 counties to check the availability of key budget documents. View the results of our March, 2019 update. View and download resources and guides to further your understanding of how to read and use key Kenya budget documents. View and download materials describing and analyzing Kenya’s national budget process, budget presentation, budget legislation, and budget allocations and expenditures. 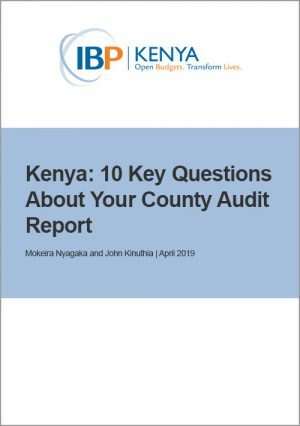 View and download Kenya county budgets, tools for analyzing them, information about the Kenya county budget process, public participation at county level, our assessments of county budget transparency in Kenya, and analysis of specific Kenya county budgets. View and download resources related the division of revenue between Kenya’s national and county governments, as well as well as IBP Kenya’s analysis and recommendations related to the formula for sharing revenue among both levels of government. View and download work by IBP Kenya partners at the national and county level with specific relevance to budget transparency and public participation in budgeting.